Invest in real estate in Miam i- The best places in Miami for your new home! There is a time in life when you consider your future- regarding place where you live in, a house that is your home, job you are doing etc. Some of the people are generally satisfied with what they have, but most of them always generally seek for better. In that case, you are seeking better city, better home, the better job, or all of that. What is generally assumed when you change each is that you would have to relocate to another place. If your decision is that the best city to move to would be Miami, this is the right place for you! When you are considering relocation, first thing(after having the will to move, and having money to get started there, which is essential to actually move) is where shall you live! That is why we are going to give you some suggestions about where you should invest in real estate in Miami, and make it a new home. We used different criteria to locate the top places to buy the new home. Some of them were: good relationship among neighbours, low crime rate, affordability, chances to have a good time and much more. Therefore, when you have picked a real estate to buy, you would be sure that you will be able to enjoy in much more than just in a building per se. Also, what is worth mentioning is that we did a research among inhabitants of neighbourhoods on what they think of their neighbourhood and where would they move if they had to. We summarised the answers and those areas that we are going to mention are the best, picked by inhabitants of all neighbourhoods, to invest in real estate in Miami. The real estate market of North Beach has constantly grown from 2013, and there are forecasts, based on economic data that this trend is going to continue. Therefore, know that, if you are hesitant about where to invest in real estate in Miami, investing in real estate in North Miami Beach now means earning money in the future. Besides these strictly economic data, what makes this area wanted and likely to be more valuable in the future is the major roadways, connecting south and north and making access from North Miami Bech to these areas easy. North Miami Beach used to be known by the name Fulford, which was the original name for this area, invented in 1926. It gained name North Miami beach back in 1931. There are approximately 42.000 people living in this neighbourhood, with 16.400 households. The most spoken language, since 2000, is English, and the second one by a number of people using is Spanish. During the 80’s North Miami expanded the territory covered by parks, so there are great territories with the availability to enjoy nature without leaving the neighbourhood. The Country Club real estate market has also constantly grown since 2013, but the information that forecasts for 2017 is a bit less optimistic than for the North Miami made us put it in the second place. Nevertheless, the forecast is certainly not pessimistic, and therefore we also recommend this place in Miami for purchasing a real estate if you want the value of your property to rise, and even less optimistic forecast is an optimistic forecast, so the growth of the market is still predicted to continue. Together with demographical data showing the rise in movers to Miami, it makes the pretty good chance to earn money, if you invest in real estate in Miami, specifically in Country Club. Before it was invented as a city, after the country club of Miami, it was a unpopulated and undeveloped area. Since then, many things changed, as you can see according to this data. The population of this neighbourhood is approximately 37.000 people, living in 13.000 households. Most of the people, more than a half, speak Spanish, and only less than one third speak English. 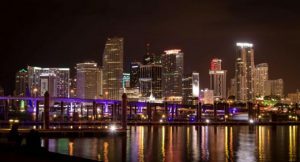 It was very dubious whether we should put this place on the list of 3 top places to invest in real estate in Miami for the prices here, being that this article was meant to be a guide for the average salary people. But the stability of the market here forced us to do that. The forecast for 2017 is that the demand will slightly fall, with declining prices, and after that, it will come back on the road of rising prices. So, isn’t this the best moment to invest in real estate in this part of Miami in 2017? Being that it is part of Miami, the number of immigrants will also rise, which will constantly cause the rise in prices. Wynwood has to major districts- The Wynwood art district and the Winwoodfashiondistrict. It was referred to for a long time as Little San Juan. There are near 15000 inhabitants here placed in 6000 households. Talking about languages, Spanish is spoken by most of the inhabitants. You can visit over 70 galleries in Art district and enjoy in this place mostly popular by the culture of it. The other part of Wynwood, the fashion district, offers Miami Fashion district. What we must conclude the text with is the explanation that we did not use the single perfect criterion to choose where you should invest in real estate in Miami. We used the acceptability factor under consideration, which means that places were firstly ordered in terms of housing, later we graded them by an opportunity to enjoy your life in many ways. These three neighbourhoods survived the selection that we made, which was very strict, and therefore we can say- if you invest in real estate in these three neighbourhoods, you are lowering chances of the bad decision to a minimum.